After some strange server problems, the live Eastern Phoebe Web Cam is back up and running. The Eastern Phoebe has been on the nest every night this week cooking up a new batch of eggs for round 2 of nesting. So far so good. Four days, four eggs. We're really hoping the Brown headed Cowbirds don't come back to the nest. We checked the phoebe nest about 400 feet from this one and it currently has cowbird eggs in it. 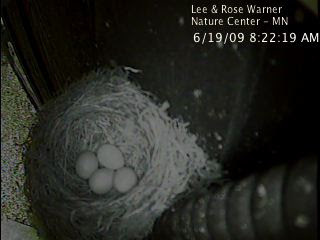 I expect the phoebe will lay one more egg tomorrow morning and then start incubation.